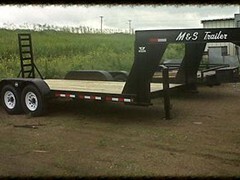 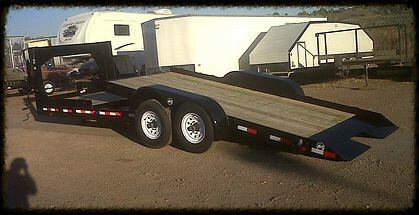 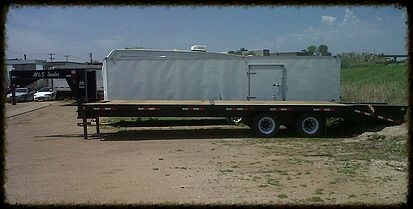 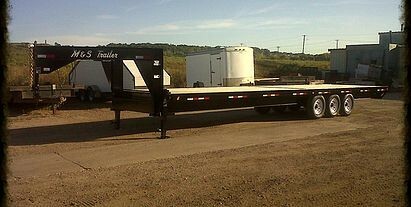 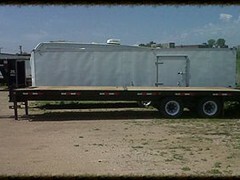 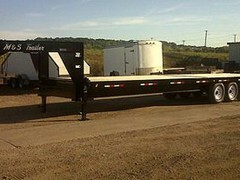 Below, you'll find some examples of our Custom Gooseneck Trailers. 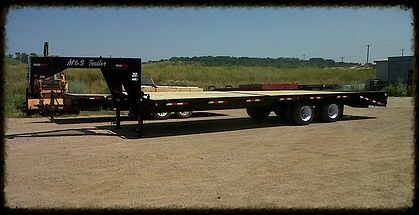 If you'd like us to work you up a Quote for your trailer project, just click here and we'd be glad to help you. 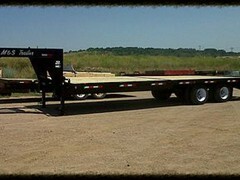 These are available for loads between 10,000 and 30,000 pounds. 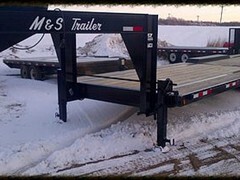 They are used for larger trailers and provide considerably more stability than does a traditional hitch. 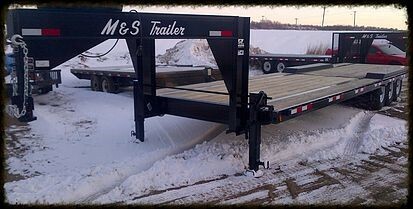 Both styles have trailers attach to a coupler mounted above the axle within the bed of the tow vehicle such as a flat deck or pickup truck. 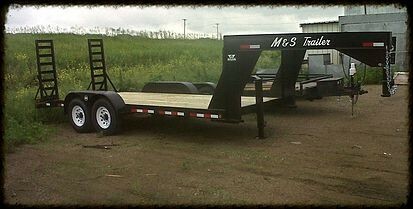 A fifth-wheel coupling is also referred to as a kingpin hitch and is a smaller version of the semi-trailer "fifth wheel". 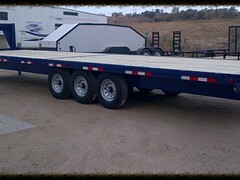 Though a fifth wheel and a gooseneck trailer look much the same, their method for coupling is different. 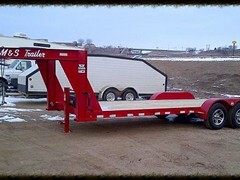 A fifth wheel uses a large horseshoe-shaped coupling device mounted a foot or more above the bed of the tow vehicle. 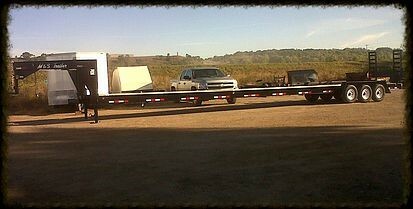 A gooseneck couples to a standard 2 5/16-inch (59 mm) ball mounted on the bed of the tow vehicle. 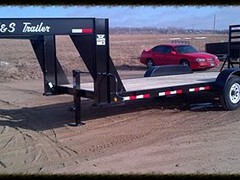 The operational difference between the two is the range of movement in the hitch. 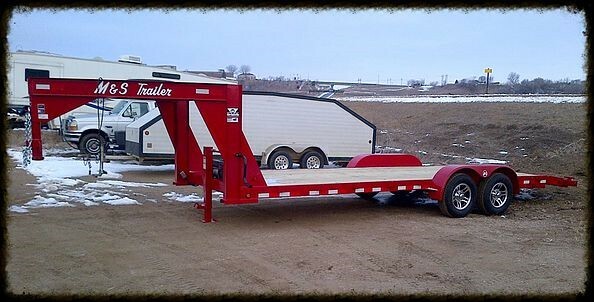 The gooseneck is very maneuverable and can tilt in all directions, while the fifth wheel is intended for level roads and limited tilt side to side. 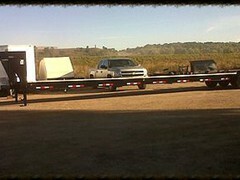 Gooseneck mounts are often used for agricultural and industrial trailers. 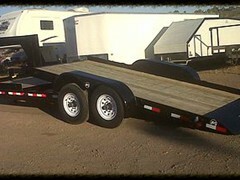 Fifth-wheel mounts are often used for recreational trailers. 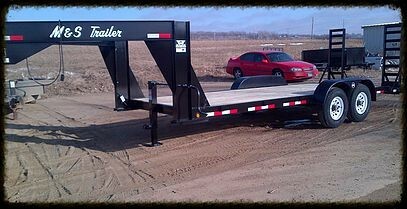 Standard bumper-hitch trailers typically allow a 10% or 15% hitch load while a fifth wheel and gooseneck can handle 20% or 25% weight transfer.